The Online Booking system can be accessed through multiple platforms to suit your business model. This article explains the different options available and shows how to generate a link to access the Online Booking system. To avoid booking issues, make sure Staff members, Services, Classes and Locations are enabled and configured before making the Online Booking system accessible to Clients. 3. Select a Starting Point for the Online Booking process, either ask the client to pick a Location or direct the client to a specific Location. If you have one Location, pick the Location as the start of the process to avoid confusion. 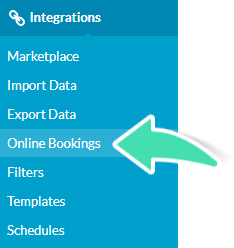 If you have multiple Locations, you can choose to have a different link for each location available or to have a single link so clients choose their location at the start of the Online Booking process. 4. Choose the Type of link. Note that the choice is determined by the platform in which clients will be accessing the booking system from. 6. Select and copy the Code generated. 7. Paste the Code where appropriate based on the type of link. See below for specifications on each type of link. If unsure which link to use or where it should go, get in touch with your Website developer or IT consultant for further assistance. 1. 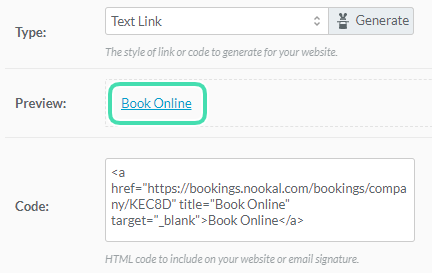 “Book Online” Button: This code can be added to a website or email signature to redirect clients to the Online Booking form. 2. Embedded: When added to a website or email signature this code will display the Online Booking form directly on the website or email signature. 3. Text Link: The Book Online text can be added on a website or in an email signature to redirect clients to the Online Booking form. 4. URL: Link without any button or text that can easily be shared over email and on social media to redirect clients to the Online Booking form. This link can also be used to add a Book Now button on a Facebook Business Page, see Linking Online Bookings to Your Facebook Page for more details.